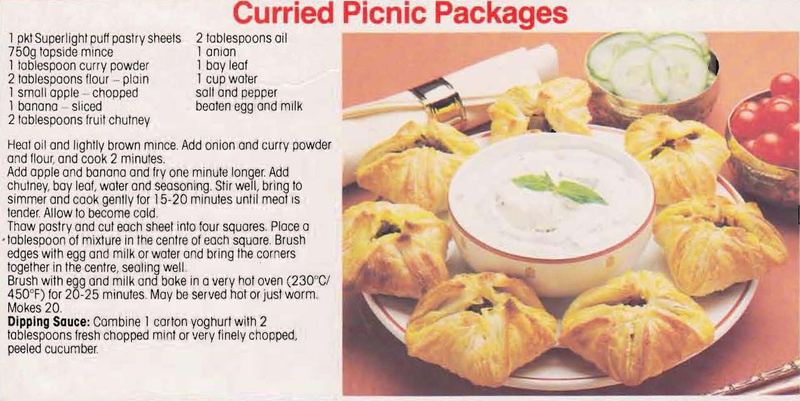 You can tell this an 80s recipe by the lovely wooden bowl and spoon in the picture. Not convinced that the spoon would be much good for getting the casserole out of the bowl though. Think a more modern metal one would do a far better job. Finding things that are easy to make, taste good cold and are transportable for a picnic is always a challenge. Homemade pasties have always been a family favourite with us. I think this recipe which adds a little curry and fruit to the traditional flavour is a bit of a winner. 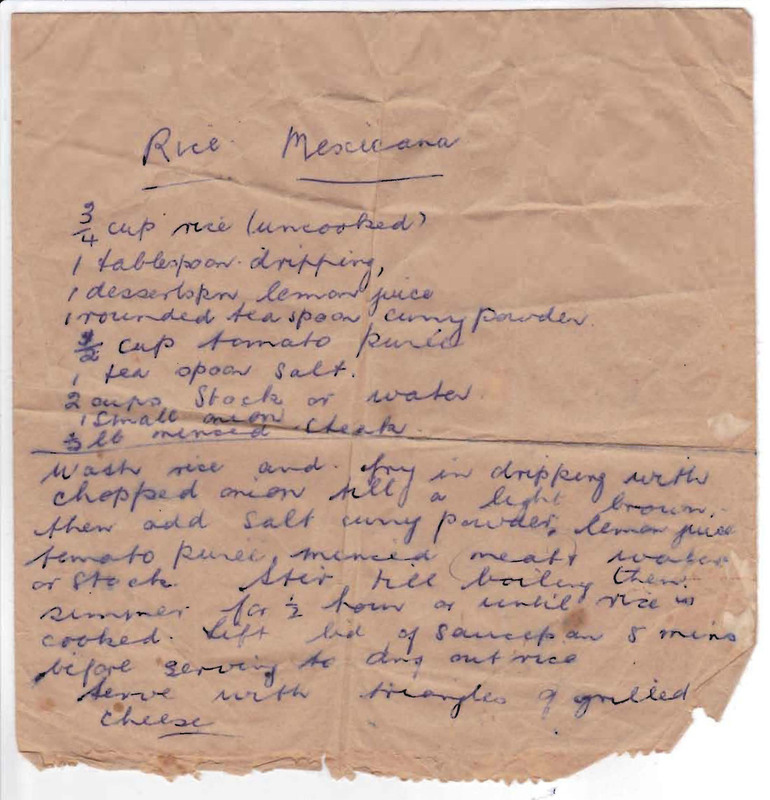 I doubt that this is even close to being a genuine Mexican recipe, but it does show the influence that “foreign” food started to have on Mum’s recipe collection. 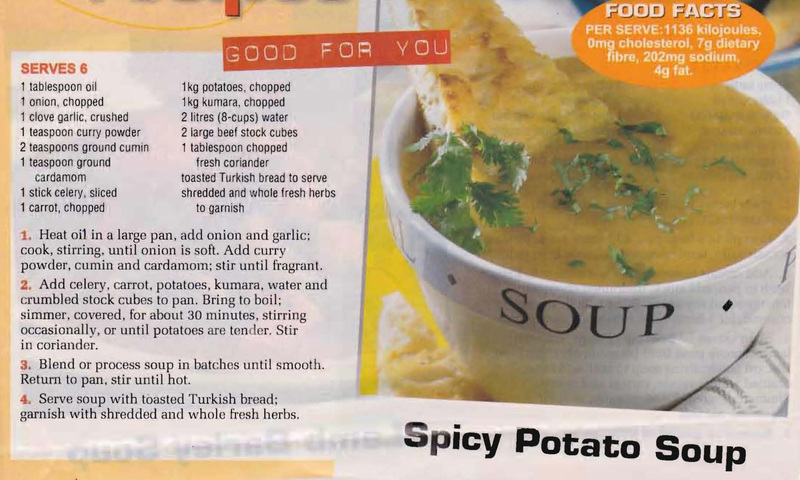 It was another Sunday night tea – easy to make, filling and tasty. I love that it was written on a brown paper bag!! Wash rice and fry in dripping with chopped onion till a light brown then add salt, curry powder, lemon juice, tomato puree, minced steak and water or stock. Stir till boiling then simmer for ½ hour or until rice is cooked. Lift lid of saucepan 5 mins before serving to dry out rice. Serve with grilled cheese on top.